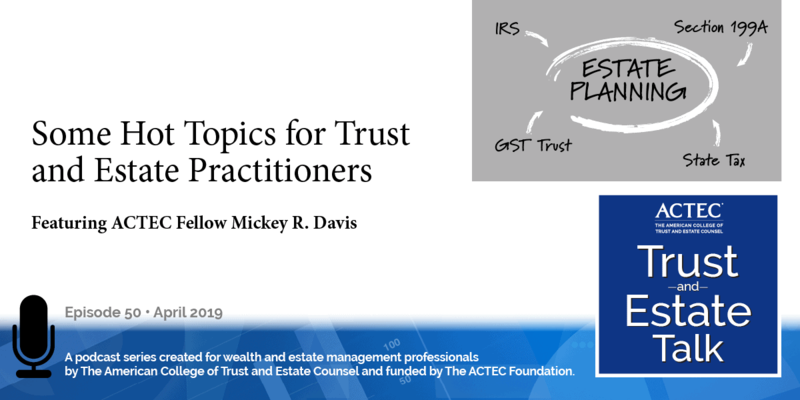 “Trust Residency and State Tax Nexus Planning.” That’s the subject of today’s ACTEC Trust and Estate Talk. This is Susan Snyder, ACTEC Fellow from Chicago. There have been a lot of recent developments amongst the states in the area of state taxation as it relates to trusts, including the recent Wayfair US Supreme Court case, and the cert petition of Kaestner. 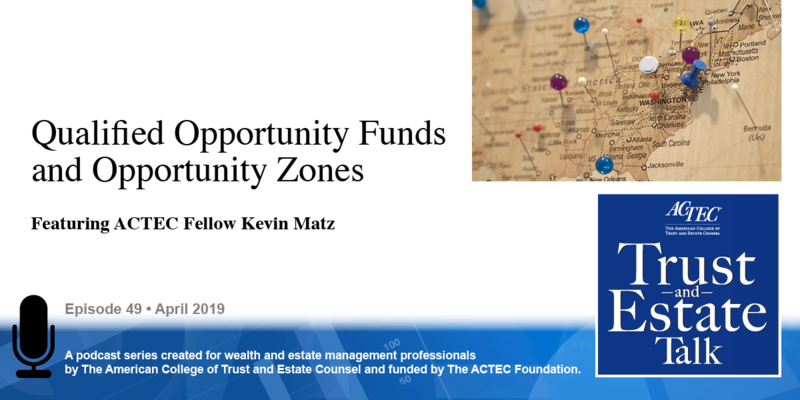 To discuss these topics you will be hearing today from ACTEC Fellows David Berek of Chicago and Raj Malviya of Grand Rapids, Michigan. Please note, this podcast was recorded before the U.S. Supreme Court granted cert in the Kaestner case. Welcome, Dave and Raj. Thanks, Susan. So we would like to start off by talking about the Wayfair case, that has gotten a lot of press lately, right Raj? In our industry we’ve kind of whirled ourselves into a frenzy whether that applies to trusts or not. We think that, as a general premise, big case for state taxations SALT (State and Local Tax) practitioners, but for trust and estate practitioners, not so much. And that’s because there really is no physical presence component to trust fiduciary taxation. And so although it’s a significant case for our SALT practitioners we don’t think it really impacts our analysis of fiduciary income taxation and trust, would you agree Raj? Yeah, I do. And, Dave, I would add it’s still an important case for other reasons, and mainly to distinguish it from how it’s so much different than the typical application of a trust, which is really a relationship between a trustee and a beneficiary as opposed to, you know, the taxpayer and Wayfair, which was a national company entering into a commercial transaction with consumers and a “stay” in an agreement where both parties have consented to the transaction. Yeah, so when I think we look at the fiduciary income taxation of trusts we’re worried about where the trusts are created and whether that trust will continue to pay tax in that particular state. So, a typical scenario would be- and this is based on the facts of an Illinois case called Linnwhere the granter during his lifetime created a trust in Illinois and then years later it ended up with nobody living in Illinois, no property in Illinois, the trustee was not in Illinois, yet Illinois, under their statute as applied, said that we’re going to tax this trust for eternity. And that just sounds really harsh, I think when I tell most clients that that’s a potential here when we’re looking at where you might want to set up a trust, the fact that you could still pay tax in a state and have no connection whatsoever just doesn’t sounds right. And so in Linn the taxpayer won but was very specific to that particular case and any other Illinois trust still has got to apply the basic rule which is if you’re alive in the state when you created it, it’s subject to tax in that state or if you died and it was a testamentary trust, it’ll be subject to taxation in that state. And that’s the rule in roughly 27 states, right Raj? That’s right Dave, it’s the rule in Michigan and, I would also add to that, when we would talk about the application of these cases, most of the time you’re going to see state courts if you’re going to declare a state residency statute of trust unconstitutional it’s going to be applied to that trust, so we never see the issue clarified with the statute itself being declared unconstitutional. So let’s move into a more recent case, recent as of yesterday (podcast was recorded in October 2018), the Kaestner case is a North Carolina case that has gone through the system in North Carolina, now we understand just yesterday they filed a petition for certiorari in the US Supreme Court and so we may have yet another tax case coming out of the Supreme Court, which is kind of rare, right? So, lucky year for us. However, the case itself I think both of us feel is a little bit of an unusual case in that the facts set up just doesn’t seem like the best case to bring up to the Supreme Court from the state’s standpoint. You want to talk about the facts a little bit Raj and we’ll find out why that’s important? Yeah, just to run through Kaestner quickly, Kaestner was the decided by the Supreme Court of North Carolina on June 8, 2018 so, interestingly, this was only a few weeks before South Dakota v. Wayfair was decided in our Supreme Court and Kaestner relied on a case of our Supreme Court from 1992, Quill Corp v. North Dakota, which is one of the seminal cases cited for these constitutional issues that you see in these trust state taxation cases. That’s mainly two components to the constitutional analysis, one is the due process, the other is commerce clause. 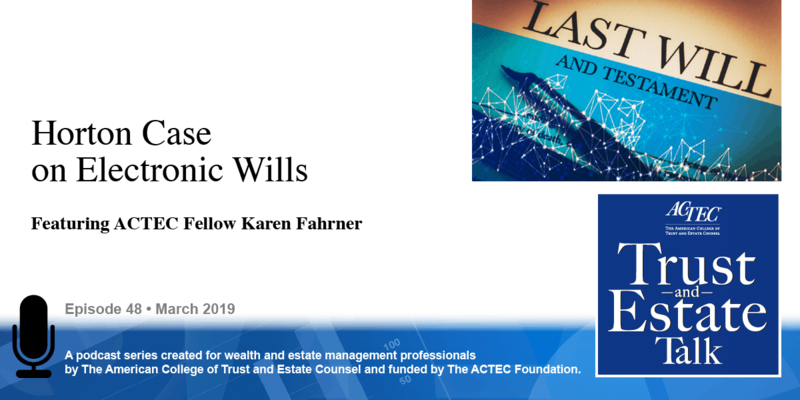 Kaestner involved an irrevocable trust and all of the contacts of that trust, including the creator of that trust, were out of the state of North Carolina, with the exception of a contingent beneficiary. This was a purely discretionary beneficiary, she was a resident of North Carolina, but had no interest in the trust, no right to the trust, no vested interest in the trust. So that’s an important fact because when we say contingent we mean that beneficiary may not ever get distributions from that trust, right? That’s right. Part of the relationship. Not mandatory distributions, they may not get anything, completely discretionary. Absolutely. And so, you know, the court looked at both the commerce clause and the due process clause in the lower court, focused on the due process clause in the court of appeals and then the supreme court affirmed, bottom line is the court held North Carolina’s residency statute which bases taxation on if a resident receives a benefit from the trust was unconstitutional under due process. And so due process is really looking for- and you said the supreme court, that’s the Supreme Court of North Carolina- and so they found in favor of the taxpayer because they didn’t find this definite link, this minimum contact that is the constitutional principle underlying Quill. And so that’s the case that they’re now bringing up- the state- is bringing up to the Supreme Court to have decided. And I think that if I was going to pick any of the various state fiduciary income tax cases, this would not be on the top ten list. It’d be tough, it’s going to be tough for a couple of reasons. Real quick, number one is the minimum contacts test even though it doesn’t require a physical presence, and that was decided under Quill in 1992 by the US Supreme Court, it’s really tough to find minimum contacts with a contingent resident beneficiary of a trust when, as you said earlier, Dave, there’s just really no right to any of the corpus or income of that trust, it’s purely discretionary. Number two is, the facts in Kaestner, if you read the North Carolina Supreme Court’s opinion really went into detail about distinguishing a relationship where you have a discretionary beneficiary and a trustee and really we’re looking at the trustee as the taxpayer for the trust, not the beneficiary. We usually look at it that way quite frankly, the trustee has a legal title to the property and they should be paying the tax and if the beneficiary receives a distribution, they will be paying tax, right? Because they got a distribution from a trust. That’s really not the issue. So what could we do moving forward from a planning perspective for our clients? Because I find in our practice- “our” meaning we, estate practitioners- clients move and when they move they move to states that actually have an income tax so you can’t really do much about that but we want to think about what types of trusts might we want to avoid. Right, and great point. 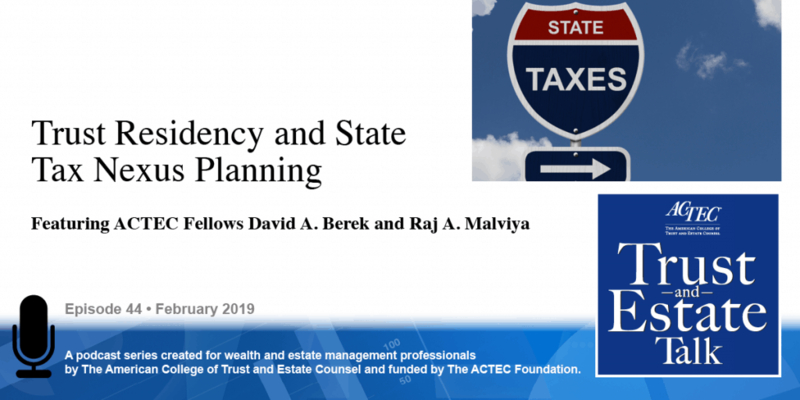 The easy answer for practitioners is try to get your clients to set up trusts in jurisdictions that don’t have a state income tax, and I believe there’s seven of those right now, right David? So set up the trust as opposed to waiting to have it be created upon death, so probably avoid testamentary trusts if you have a choice. And you can lock in your state, right? Right, and the reason to avoid testamentary trusts is there’s still a couple cases on the books in different states, one being the Gavin case out of Connecticut from 1999. 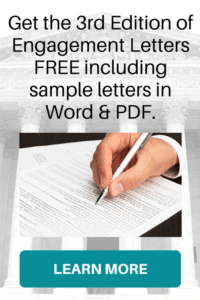 That’s a problematic case because those types of cases have held against the taxpayer finding that the due process test has been met because the minimum contacts really was satisfied because the probate court of that state was involved and provided a benefit to processing that will and enabling that trust to be created. Yeah, so that’s always an argument that might pop up. What do you do if you have a trust that is in a state that you believe is suspect, I will say, I will use Illinois because we have a case that the taxpayer won, yet, if you want to take advantage of that I have to tell my client well we may have to litigate it. We’ll rely on the facts of that case but you have to go through litigation. So, what about moving the trust? What do you recommend in that area? So if I have an Illinois area trust and I say I don’t want to go through litigation I’ll just move it to Florida. Yeah, I mean the two things I would do is you know you obviously want to know the residency statute of the state you’re in and find out can you break nexus? What types of steps do you have to go through to move the trust? That might be done through a decanting, that might be done through maybe a determination of the trust and merging the trust, but the problem is you might be setting yourself up for another problem because, to use those types of procedures- I mean, Dave, are you using state law to enable that practice? Yeah, so I’m hesitant to use a decanting statute of the state. I wouldn’t want to use the Illinois decanting statute to move the trust out of Illinois because I think now I purposefully availing myself of the state laws, which is one of the indicators they would use to tax it. And if you did a purposeful availment or if it was viewed that way, that triggers due process and you can arguably have some minimum context. Right, so I stay away from decanting, anything else that you would advise? Yeah, I mean, I think it’s more just being aware of what states are out there that have enabled legislation where you can create incomplete gift trusts that are non-granter. Delaware is one of them, there’s a handful of other states that have now followed along those lines and those might be a good option, but you know Dave, what are some of the traps if you’re going to look to an ING type of trust? I think it’s always- an ING trust is specific for a purpose or a motivation of your client- so it does, however, these changes in the states do raise the question of we should be looking at them because everyone’s different and I always bring that up to my clients that it’s always unlevel playing field and, as much as it’s kind of difficult to deal with these different state laws, we should be using that to our advantage. It is an unlevel playing field so let’s use it to our and our client’s advantage. Yeah, and I would just say just a couple quick closing comments. Number one, there’s no rule that prevents a trust from being a resident of more than one state, so I think as practitioners we’ve got to be cautious and making sure we know where all the contacts are and whether we’re unnecessarily triggering a state nexus statute that could trigger more tax. And number two is, I think as much as we want to see the Kaestner decision be upheld, I think having the Supreme Court in the United States look at this issue would be helpful because I think it could clarify and settle this issue of nexus and due process and maybe even commerce clause if the Supreme Court wants to look at that. We’ll see if they grant cert on Kaestner. Alright, thanks Raj, thanks Dave for talking to us about the trust residency and state taxation. For more information on this topic check out Situs and the Resident Trust.